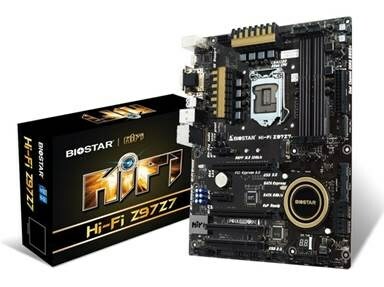 BIOSTAR has launched the first development of what might become a possible series of high-end gaming boards, the Hi-Fi Z97Z7 motherboard, a board with cutting-edge features and innovative durability enhancements. The Hi-Fi Z97Z7, based on the Intel Z97 chipset, comes with key features such as a PCI Express 3.0x16 slot, PCIe M.2 support, and BIOSTAR exclusive Super Hi-Fi Audio technology. The Hi-Fi Z97Z7 is an ATX form factor board that features Intel socket 1150 support. It has 4 memory slots for up to 32GB of 2800(OC) RAM. The on-board HDMI supports 4K and 2K resolutions. There is also the introduction of the SATA Express Connector which supports both SATA and PCIe storage solutions giving maximum data transfer speed of up to 10Gb/s. BIOSTAR’s in-house technology is evident here with features such as Super Hi-Fi Audio and power regulation upgrades like Hi-Fi Power and Hi-Fi AMP. The video outputs include HDMI with HDCP which allows full video & Hi-Fi 7.1ch Blu-Ray audio support via standard DVI output. All the BIOSTAR Hi-Fi series motherboards are equipped with special components to ensure the best possible audio quality consistency. The Hi-Fi Z97Z7 will feature new BIOSTAR innovations that improve durability and stability even further. One of those features is Super Durable Solid Caps. These are the best quality solid state capacitors with ultra low ESR design, which doubles the lifespan. Another feature is 8-phase power design which gives unparalleled overclocking ability and the lowest temperature to reach maximum performance levels. There is also Super Hi-Fi Audio Connectors which are 30uF “Golden” plated audio connectors providing superb signal conductivity, less oxidation, and the best possible studio-grade headgear. The Hi-Fi Z97Z7 will feature the new Super Durable Ferrite Choke which brings the benefits of higher current capacity, lower energy loss and better power stability to the electric current running on the board. In addition to that is the Super Conductive Heatsink Design which is a massive heatsink which provides super fast heat dissipation, high stability and reliability for extreme performance. The Hi-Fi Z97Z7 will come with super durable box headers providing solid, secure and durable connections between the motherboard and peripheral cables. When running such high-end machinery sometime such tight tolerances call for some expert debugging of overclocked or highly stressed systems. For that, there will be Super Rapid Debug 3 which gives out critical POST code information on a vivid digital LED display. This greatly helps trouble shooting of a system. The MSRP is estimated USD $119.